The fourth-generation Mazda MX-5/Miata is 100kg lighter than the current car and has a lower center of gravity. MONTEREY, California, USA -- Mazda, which has staked its future on making its cars lighter, more fuel efficient and more fun to drive than their competition, revealed the purest execution of that strategy: a redesigned MX-5/Miata built with Mazda's full suite of Skyactiv technology. Mazda hosted simultaneous events in Japan, California and Spain on Wednesday to celebrate the 25th anniversary of the roadster and to unveil the design of the fourth-generation model, scheduled to go on sale in global markets including Europe and the United States next summer. Mazda Europe CEO Jeff Guyton believes the MX-5 will further accelerate the automaker's sales in the region, where the brand's volume is up 21 percent to 105,142 units through seven months. The roadster, which will have its public debut at the Paris auto show in October, is responsible for just 1 percent of Mazda’s global sales, with 14,000 units sold worldwide in the fiscal year that ended in March. But its nimble handling and back-to-basics design have found a small but fanatical fan base, turning it into a halo car for the small, now-independent Japanese automaker. 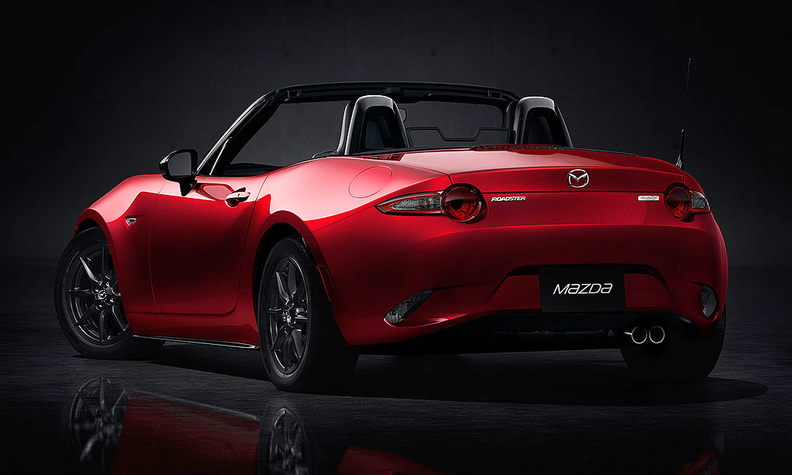 To satisfy the fans, Mazda will give the MX-5 a Skyactiv engine, transmission and chassis. The engines from that portfolio are rarely impressive in terms of horsepower, but they boast high compression ratios for efficient fuel combustion, while the Skyactiv chassis are light enough to help with fuel economy and handling but rigid enough to perform well on modern crash tests. One target for Mazda is more responsive driving and better fuel economy. With its new Skyactiv drivetrain and lighter curb weight, the new MX-5 should eke out better fuel-efficiency ratings than the 24 mpg combined (9.8 liters per 100km) of the outgoing version. Mazda delivered substantial mpg improvements when it redesigned its Mazda3 compact sedan on the Skyactiv platform. Mazda says the redesigned MX-5 will be about 100kg lighter than the current model. The weight reduction also puts the new MX-5 at a level comparable to the original model, which was launched in 1989. Few other details have been released about the redesign, the first since 2005, but the new MX-5 is expected to have a 2.0-liter four-cylinder engine mated to a six-speed manual transmission. When the rotary-engine RX-8 was discontinued at the end of the 2012 model year, the MX-5 took on added importance for Mazda, which takes pride in its racing heritage. 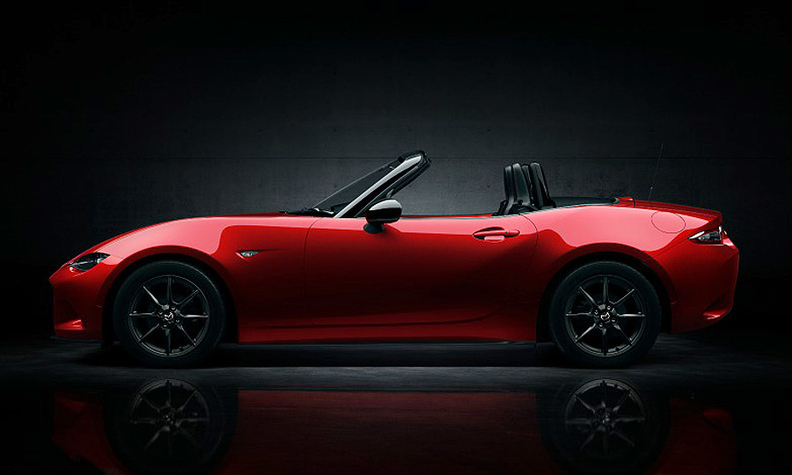 The design of the fourth-generation MX-5 remains true to the original, said Bob Hall, a former Mazda product planner who has seen the redesigned roadster. "Keeping it light and simple is what has allowed the Miata to survive," he said. "That's the evolutionary secret it had." It was Hall who drew the first sketch of the roadster in 1978 during a visit to Mazda’s headquarters in Hiroshima, Japan. At the time, Hall was working as West Coast editor for Automotive News and sibling publication AutoWeek. He crafted a plan and a design for the roadster with colleagues Mark Jordan and Tom Matano after joining Mazda’s r&d department in 1981. The mantra in development was jinba ittai, a Japanese phrase that roughly translates to "rider and horse in one body." Mazda now uses that analogy often to describe its Kodo design language and its approach to driving feel in mass-market models such as the Mazda3 compact car and the CX-5 crossover. Hall said Mazda’s engineers faced a particular challenge in keeping the new MX-5 true to the original because of modern crash tests. 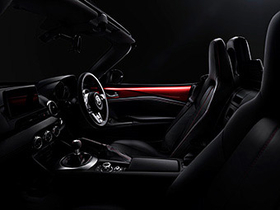 Inside the redesigned MX-5 Miata planned for the Japanese market. This update to the MX-5 was a fresh challenge for Mazda from a business perspective as well. Development kicked into gear soon after Ford Motor Co. sold most of its 33.4 percent controlling stake in Mazda in 2008, forcing the latter to confront the cost of developing a low-volume sports car all on its own. 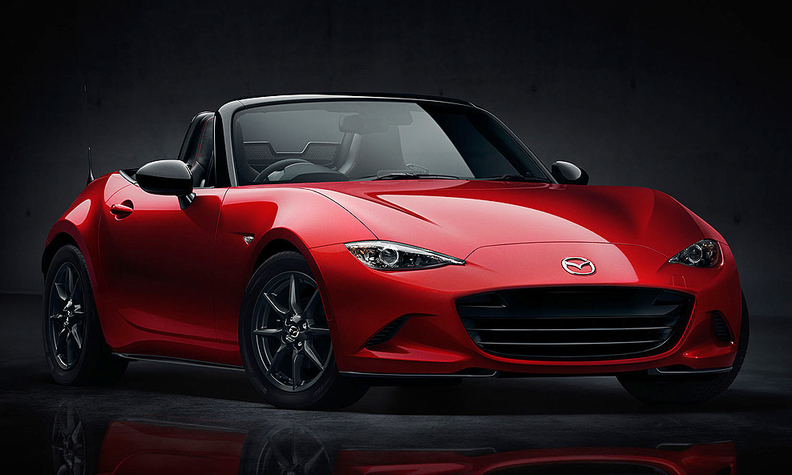 To spread out the cost of development for the MX-5’s compact rear-wheel-drive platform, Mazda agreed to use its underpinnings to build a roadster for Fiat Group. That car, which will get a Fiat Group powertrain and new styling, is scheduled to go on sale in late 2015. When the agreement was announced in May 2012, the two companies said Fiat’s roadster would be sold under the Alfa Romeo brand. But when Fiat released its five-year plan this spring, the Italian automaker signaled that the car will bear a Fiat or Abarth badge. "It’s important that the Fiat version doesn’t come across as a badge-engineered version of the Mazda," said Kim, the AutoPacific analyst. "As long as they can successfully pull that off and paint a clear picture to the consumer about what each one represents, then whatever sales volume Mazda may lose will be more than made up for by the considerable savings on the r&d end." The inspiration for the original MX-5 was small British and Italian sports cars of the 1950s and 1960s from brands such as Alfa, MG and Lotus. European luxury brands such as BMW, Mercedes-Benz and Porsche all followed Mazda back into the roadster segment and have stayed in the market. But inexpensive roadsters have again become an endangered species. Of the mass-market roadsters launched in the 1990s and 2000s -- such as the Honda S2000, Toyota MR2 Spyder, Pontiac Solstice and Saturn Sky -- none made it through the last economic downturn. For now, the MX-5 stands alone, as a symbol of Mazda’s current Skyactiv strategy for developing models. "All these cars that got launched were going to be the Miata killer," said Hall, the former Mazda product planner. "They said: ‘We can make [our car] better by making it bigger and more powerful.’ Making something bigger and more powerful doesn’t always make it better." Hans Greimel contributed to this report.